We come from an ancient tradition that watched the movement in the night sky and the cycle of the Moon and Sun during the day. From this dance we divine meaning for our lives through the art and science of astrology. The ability of the early astronomer/astrologers was limited by what they could see with the naked eye. The longest observed time period was the 29 ½ year cycle of Saturn. 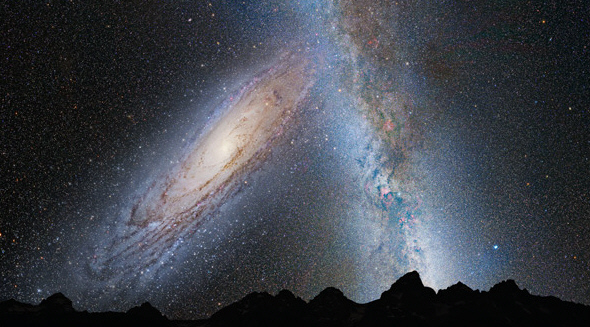 nasa/2012/31may_andromeda/ Today our concept of time has expanded to astronomical proportions. On May 31st a panel of scientists broadcast their latest findings on the movement of Andromeda and Milky Way galaxies. With the help of the Hubble telescope and careful mathematical calculations over the past 7 years they were able to determine where these two galaxies will collide and merge in 4 billion years. These two galaxies lie outside the Virgo Supercluster. All are part of a large galactic cluster known as The Great Attractor (Sagittarius 14N02' tropical zodiac) . 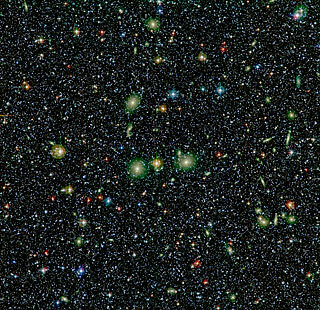 This enormous mysterious collection of galaxies and stars is pulling things towards its center. The Lunar Eclipse Moon at 14 Sagittarius 13 draws our sight towards this mysterious place in the sky. What lies out there at the center of this anomaly? Is it God? Is it our fascination with the unknown? Ruled by Jupiter our imagination leads us to soar beyond the here and now into a place where time and space become unlimited. The symbol for the Sun is 15 Gemini: A woman being visited by a mystic. What mystical information will come to us from deep space? "This eclipse family will tend to bring success. There may have been long periods of hard work from which the success has grown. With the Mercury-Pluto content [of the birth chart of the series] there is also the potential for an obsessive idea to finally be accepted, which then lead to the promised success of Jupiter. During this eclipse period individuals should push for acceptance of their ideas or methodologies as this eclipse can bring the long awaited breakthrough." The Fairchild Symbol is Gemini 1: A well used library. Square to Neptune at Pisces 3N 05'. The symbol is Pisces 4: Wild reindeer running through a valley.In the midst of confusion there is a search for meaning. The challenge occurs at two levels - communication with other people and connection to the Universal Source. The Eclipse is ruled by Mercury at 22N Taurus 34'. Taurus 23N A long dark cave illuminated. From the updated Fairchild Symbols: "The cold, dark, deep cave is forbidding. The explorer courageously beings his journey. His lamp casts shadows revealing strange formation, some frightening, some funny, many majestic and beautiful. The unconscious and subconscious are like forbidding caves. Monstrous terrors lie hidden. Light and laughter chase way the fear. Talents and skills un-mined abound. Seeking illumination and understanding brings forth rich gifts." Mercury is ruled by Venus who is retrograde at Gemini 23N 24'. The symbol is Gemini 24: A woman singing at a funeral. This is an opportunity to go within and examine how we communicate in our relationships. Review is a key word of retrograde motion. Let go of behaviors that undermine good relations and re-commit to re-establish right relations. Done in the spirit of love leads to celebration. The aspect orb between Pluto and Mercury in this chart is 133N 24' an applying, waxing, trioctile. The eighth harmonic is the motivating power behind the creative process. Involved here is a wrestling with our shadow side so that it can be brought into the light. The our inner light can shine forth so that we can relate in love. Robert Blaschke equates this degree with the Sabian symbol for Leo 14: A human soul seeking opportunities for outward manifestation. The Fairchild symbols for Leo 14 is: A writer surrounded by piles of paper works feverishly into the night.In both cases there is a desire to communicate with what lies outside of us. May 24, 2012 @ 8:45 PM in New Orleans. The Solar eclipse of May 20th in still in effect. Using the Washington DC chart - the eclipse falls in the 7th house of relationships. The energy carries over to UAC although the Sun is in the 6th house. It would seem that the message of the conference is ‘working on relationships’. The Sun 4N Gemini 16' is Gemini 5: A psychologist whose theory isn’t supported by his colleagues. The Moon phase is Crescent indicating moving towards square indicating that a struggle will be presenting itself and needs to be worked out. The Moon is 19N Cancer 24' is Cancer 20: A room filled with boxes each delicately wrapped with lace. In the 8th house in its own sign may find people fearful or protective of what they have to offer. On the other hand they may be presenting their ideas in a way that will attract interest. The aspect is an exact waxing octile (Robert Blashcke: Sabian Aspect Orbs). The" ... eighth harmonic as being the motive power behind the creative process itself." Some issues involved are: 1) past knowledge and information may not serve a current crisis situation; 2) the need to restructure existing knowledge to meet current demands and times; 3) create new ways to draw in new learners; 4) trust the creative process; 5) let go of impatience. The aspect equates to Taurus 16: A family tending large indoor gardens during the middle of winter. The emphasis is on family working together to build a community that will feed itself as well as others. The Moon squares Saturn L at the top of the chart. Saturn is 23N Libra 32' -Libra 24: An empress reluctantly begins actively leading her people after a year of mourning. Saturn makes a trine with its ruler Venus, both retrograde. The theme of the conference is VENUS ON THE RISE. Is this Venus rising out of the clamshell in all her beauty attracting all that is worthy of her beauty and love? Or is this Venus fearful of relationships and finding it difficult to communicate? The degree at which Venus went retrograde is Gemini 24 A woman singing at a funeral. In the chart Venus is Gemini 23 A trunk which has fallen overboard floats gently at sea. A loss has taken place. Old structures require rebuilding based on new ways of relating. Open communication with love, respect, and trust are the order of the day. The Descendant degree is Gemini 17: After a great loss a man starts his life anew. According to Robert Blaschke the energy of this aspect requires overcoming one’s past in order to be open to messages and to support nurturing others in the process of transformation. (Pg. 39). Mercury is a player in this chart. It rules the Sun, South Node, Descendant, Venus, Mars, and the Midheaven. However it is in an early degree just ahead of the rising Sun blinding us to its message. It will be difficult to discover the information needed to resolve the issues of this chart. rising The symbols indicate some of the challenges. The psychologist or expert in the Sun degree may have to be strong and stand up for his beliefs. The South Node is Gemini 6: A professor challenging his students to think beyond themselves. - indicating "think outside the box" and consider other viewpoints besides one’s own. The Man in the Descendant degree seeks a new life based on renewed relationships. Venus is letting go of old ways of relating that no longer support cooperative ventures. Mars degree is Virgo 13: A man in a wheelchair wins a race. Whatever difficulties arise, they can be overcome. The Midheaven is Virgo 20: Treasures found in an antique junk shop. Astrology has a rich history which needs to be honored for its contributions to our knowledge. Neptune is the apex planet of the Tsquare with the Nodes. The degree of Neptune is Pisces 4: Wild reindeer running through a valley. There is confusion about a direction to pursue. An opening square to the Sun indicates the need to take responsibility and get clear about how one communicates. It may involve letting go of old ways of thinking and communicating (South Node). This can be a frightening prospect for some. The North Node is Sagittarius 6: A woman applying aloe vera to her sunburn. The closing square gives a clue to the purpose of the chart HEALING within the astrological community. Jupiter rules the North Node and the Ascendant. Jupiter Taurus 26: A woman’s face stained by blueberries she has been collecting and eating. Ascendant: Sagittarius 17: Rich tapestries adorning the walls of an ancient castle. Both of these degrees point to the richness of the astrological community, both historically and currently. Mercury visited Jupiter just after the eclipse suggesting that he brings forward the honored traditions of the past as well as the current variety of applied science and art of astrology. Uranus is Aries 8: A sapphire pendant in the shape of a beetle.  A sextile with the Sun provides the opportunity to present new ideas and information with sincerity. Keywords for the gem sapphire include truth, loyalty, fidelity, and wisdom. Pluto is Capricorn 10: Mice running up and down a creaky old staircase. The image suggests lots of activity in an old, abandoned house. These small but highly adaptive creatures have taken over the establishment and are making it into a home. The square to Uranus suggests that whatever is old and outworn needs to be transformed into a safe haven. Chiron is Pisces 10: Mosaic tile depicting an Aztec ceremony. The image that comes to mind is the sacrifice of the heart at the altar to the Gods. Underlying the word is the idea that one gives up something to a higher order, thus making it holy and connecting to the Universal Source. Opposite Mars, The Man in the Wheelchair indicates a sacrifice encourages reorganization of energies towards a new goal. The Imum Coeli is Pisces 30: A woman’s basketball team. The final degree of the zodiac. Simply stated this is the astrological family. The glory of creation is in its infinite diversity. And in the way our differences combine to create meaning and beauty. StarTrek episode October 18 1968 "Is there in truth no beauty?"